I thought today’s breakfast would finish off the Wonder Bread, but we still have a few slices. Drat. 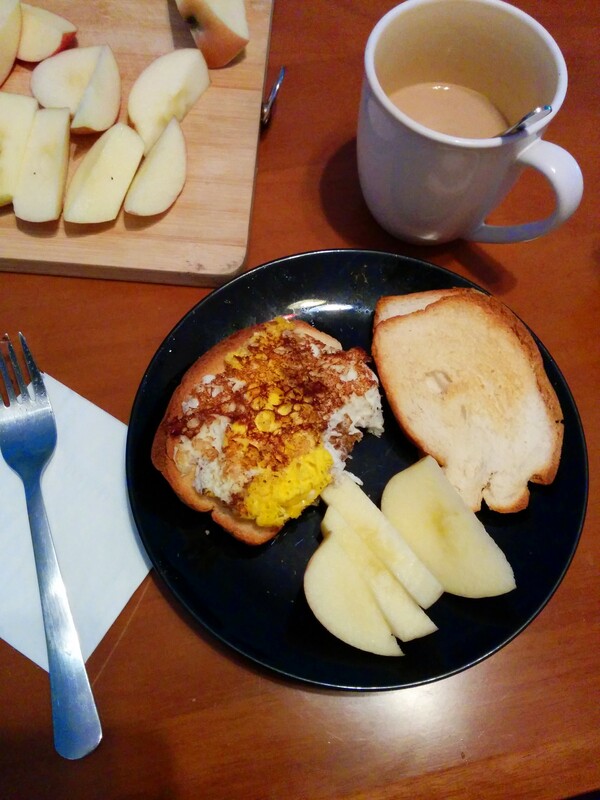 Today we toasted it, fried some eggs and sliced up an apple. Not great, but it’s better than yesterday’s breakfast. Will I buy this bread again? On the one hand, it’s convenient and cheap and my kids like it. On the other, it’s not that great tasting, and it’s probably made from powdered cardboard and chemical fluff. Luobo (daikon radish) is one of my favorites! Despite Elsa’s face, she likes it, too. Once again, there’s not a whole lot of meat, maybe 1/4-1/3 pound of pork for the whole dish. 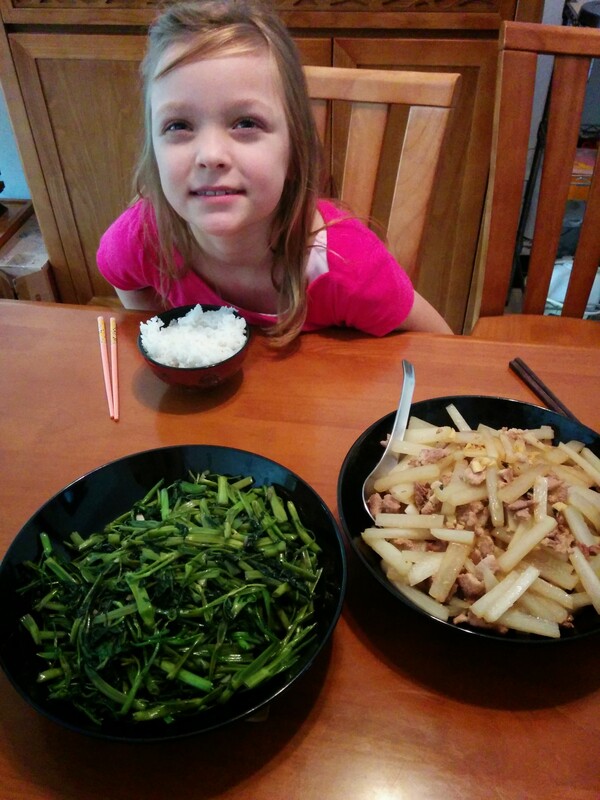 Our greens today were kong xin cai again. I seem to remember that that was one of the first things I learned to read on menus about 100 years ago when we were in Taiwan. The 心 (heart) in the middle made it easy to spot. When we first moved to China, I tried to figure out how to make Western-tasting dishes using Chinese techniques and local ingredients. Here is something I came up with then: German flavors cooked in a wok. Stir-fried pork with apples and onions, flavored with cloves, salt and pepper. Mashed potatoes made with milk, salt, and parsley. 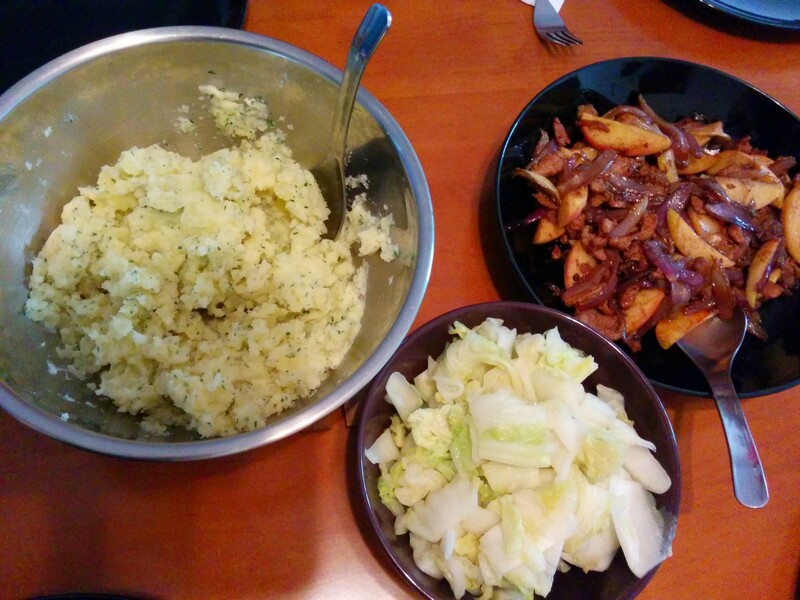 Cabbage stir-fried with salt, pepper, and some caraway seeds. The caraway, dried parsley, and cloves were brought over from the States, but everything else is local. The cabbage is even Napa cabbage, though we can usually find the “normal” kind, too. Wow, the picture makes it look pretty unappetizing. Oh, well. This will not win any contests against the real deal, but as with the empanadas, it’s still great here. The epic battle rages on in Day 5!